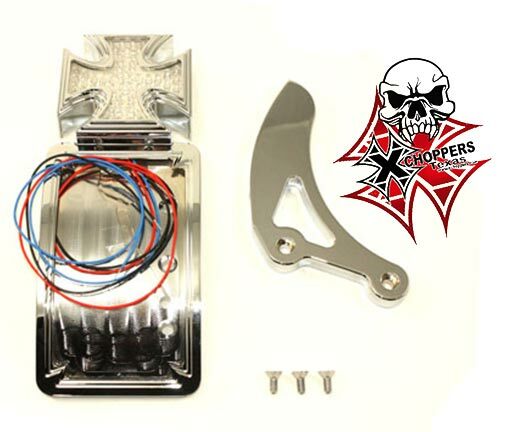 Xchoppers.com - Chrome Curved Tail Lamp Kit Maltese Type - Shock Bolt Mtg. Chrome Curved Tail Lamp Kit Maltese Type - Shock Bolt Mtg. •Large LED tail/Stop Light with white license illuminators. Light appears "white" until energized. Lights up red. •Mounts close to the final drive for a "tucked in, out of the way" look. •All Mounting Hardware included for ALL VTX and most other Hondas. Beautifully chromed, solid billet construction. •The smooth as a mirror, chrome finish on these is second to none! •Works with standard and air shocks. •This sidemount, unlike most that are made primarily to fit a HD axle is designed to be attached using a longer than stock lower shock bolt (extra length polished stainless steel bolt for all VTX included). •Wires are routed through a concealed channel to the backside of the attached mounting bracket from where you can easily hide them behind your swingarm. Notify me of updates to Chrome Curved Tail Lamp Kit Maltese Type - Shock Bolt Mtg.